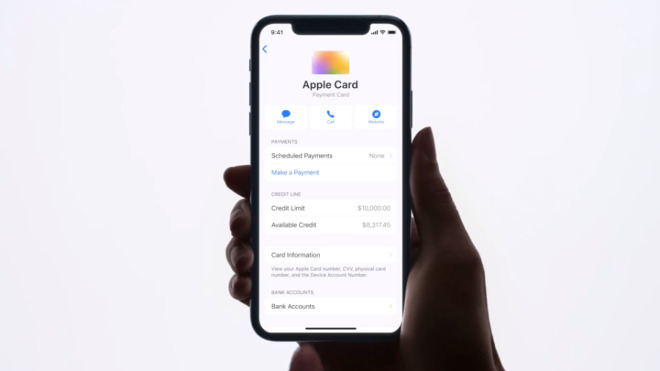 How the Apple Card will assist in managing your finances… Now it clear whenever you open your Wallet app to buy something with Apple Card, you get a huge amount of detail about all your spending —plus controls for managing it. As much as the increased security, this is why you should get Apple Card. Buying items with your Apple Card is only half of the story. As soon as you’ve purchased anything, Apple Card provides very impressive features about managing your spending. 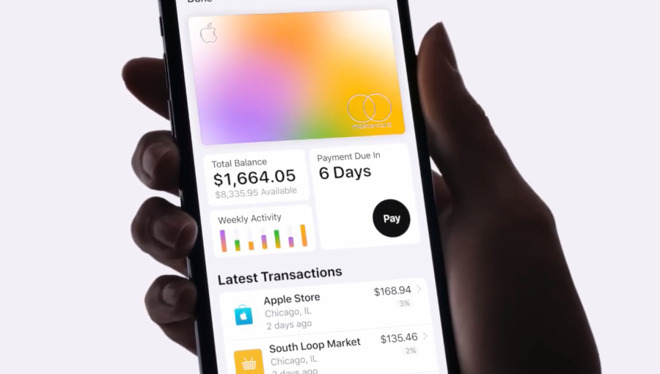 From precise details of every item —down to a map of where you bought it —through helping you analyze your spending and on to managing your balance, Apple Card will change your finances. Apple is not offering balance transfers into Apple Card, at least not at launch, so when you get yours, its balance is going to be zero. As soon as you buy anything —via your iPhone, Apple Watch, online or with the titanium Apple Card —then two things happen. One is that you are notified of the purchase. If it looks like it might not be you who made it, then you’ll get an alert about unusual activity. Otherwise, the charge gets listed in your latest transactions in Apple Card section of your Wallet app. You can then tap on any of those recent transactions to see more details about it, including a map of where you were. That’s not a lot of use if you’re on a binge buying items online from your living room couch, but for when you’re out and don’t have time to get receipts, it’s a boon. The other thing that happens is that, of course, your card is charged the purchase amount and is now carrying a balance. Let us be clear to the point of being strident about it. Your best option is always, always going to be that you pay off your credit card completely. Whether it’s an Apple Card or anything else, clearing the entire amount each month has forever been the right way to use a credit card. You don’t even have to wait for the end of the month, either. All credit cards let you pay at any time, but Apple’s makes it remarkably convenient. At any time, you can open the Wallet app, tap on your Apple Card and see a Pay button. All Apple Card users will be due to pay their balance at the end of the month. Unlike other cards where your due date depends on when you signed up, all Apple Card bills are always due on the last day of the month. It might’ve been good to have some more flexibility, to be able to make sure you’re due after your paycheck arrives, but at least you’ll never forget the date. In the middle of the screen, there’s a circular slider. At the top inside the circle, you see your total balance. And on the bottom inside that circle, you see exactly how much interest you are currently going to be paying. That, too, is plain. You’re shown an actual dollar value, not just some percentage figure. The circle around both of these is a slider. You can swipe around it to set how much money you intend to pay off the card now. There is an option for a keypad if you prefer to type in the amount, though Apple has not yet demonstrated that. 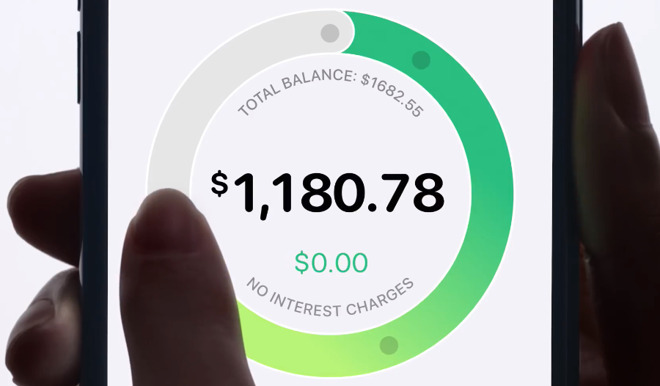 As you swipe around the circle, you are increasing or decreasing the amount you’re going to pay. As you do this, that amount is shown in the centre of the circle —and the amount of interest you owe will rise or fall to match. 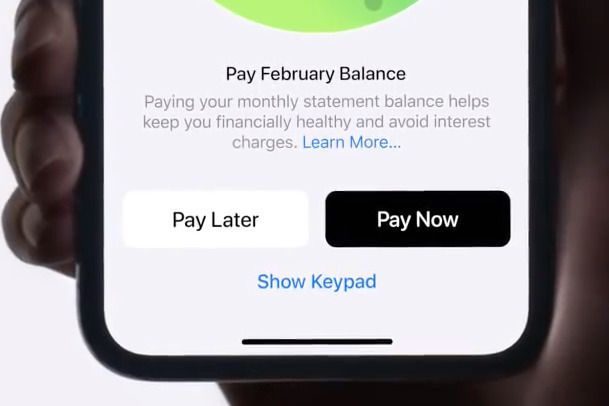 Apple says that this amount is “calculated in real time” as you swipe around the circle. However, the interest is actually charged at the end of the month so as accurate as the app may be at the time you use it, it’s still an estimate. Just as you will increase that amount if you suddenly buy a large ticket item, so you can potentially reduce the interest fee by paying early or more often. Most credit cards have a minimum amount you have to pay. When you open this Choose Amountscreen, it does not start you off at paying nothing. The central number will be some figure, some proportion of your balance, and the circle around it will be partially filled in to match. It then rapidly moves around to represent the amount you have to pay in order to owe no interest. This isn’t necessarily your full balance, but it will be close to it. So this is effectively Apple Card showing you a minimum and an optimum payment. Strictly speaking, though, Apple Card doesn’t have a minimum payment because Apple says they will not charge you late fees. Yet even without being slapped with an extra charge for being late, you are worse off if you skip a payment because you’re going to be paying interest for longer. So swipe the circle around as far as you can manage, as far as you can afford, and then tap the Pay Nowbutton. There is also a Pay Later which will take you to a screen where you can set up regular payments on a schedule. Face it, more money is going to be going out of your accounts than into it, but there is Daily Cash. Depending on how you use Apple Card, where you use it and what you buy, you will get back between one and three percent of the price of your purchase. Typically, you will get this amount of money paid into your Apple Cash Card daily. This is a second, separate account that you may already be familiar with if you’ve already used the existing Apple Pay facility to send or receive money from people. In regular use, Apple will pay you this Daily Cash amount into the Apple Cash Card. You’ll be able to see each transaction you’ve made and how much cash you’ve got back from it. From there, you can spend the money direct from this card or use it to pay off your Apple Card balance. You can see your Daily Cash amount in the Apple Cash Card part of your Wallet, but also on the main screen of Apple Card in there, too. Whenever you go to buy something, you are shown many details about your account, including the Daily Cash amount. You’re going to spend a greater amount of time in seeing where your spending is going. Or rather, you should. If you prefer to put your head in the sand and not stay on top of your finances, as unfortunately so very many of us do, then nothing Apple offers will change that. Yet no other card has quite the same level of helpful detail. There are cards that come with apps, but none that are integrated quite so deeply into iOS or offering quite such clear information. Right on the front screen of Apple Card in your Wallet, you get information. There’s the number of days before your next payment is due, for instance, and there’s also a list of your recent transactions. There’s your current balance and also the amount of money available to you to spend. However, there is also one-button access to some statistical information about your spending. By default, this is shown as a button labelled Weekly Activity. Tap this and you go into a display that shows you the various sums you’ve spent this week. 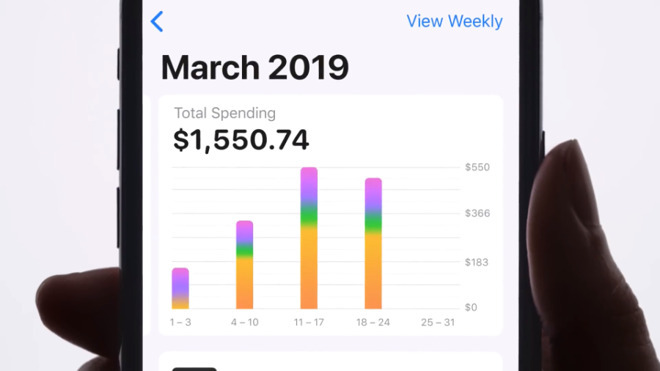 It shows up as a color-coded bar chart and you can swipe to see your spending in previous weeks. Tap the Monthlybutton and you can do the same over the current and previous months. The colors used are neither random nor editable. Apple has picked certain categories of spending such as food and drinks, entertainment and so on. It’s assigned a color to each. Then the bar showing each day’s spending is a blend of these colors. It’s not precise enough on its own to show you that, say, you spend exactly three quarters of your money on food and drink, but it will give you an overall impression. You can then scroll down from the bar chart to see a Monthly section. This lists Shopping, Food and Drinks, and so on, plus the number of transactions in that category and the precise amount spent. Very nicely, you can tap the Show Merchants button, or tap on a category, to see just what you’ve bought in these categories and what companies you bought from. If you qualify for an Apple Card, it is features like these that can make it compelling. Apple Card gives us the ability to immediately see what we’ve been spending money on, plus how much should pay back now, and then how much Daily Cash we’ve earned.